“The mouth is ignorant: after eating, it forgets who provided the food”, so an African proverb says. But it is essential that we understand how our food arrives onto our plates – a path that is a result of processes linking nature and people. A vast web of connections defines the nutrients in our stews, the incomes of rural farmers, and, ultimately, the sustainability of the planet. Understanding the footprint of our food systems and their effects on rural poverty requires finding the connections. One ambitious international scientific initiative is attempting to draw such strings together. 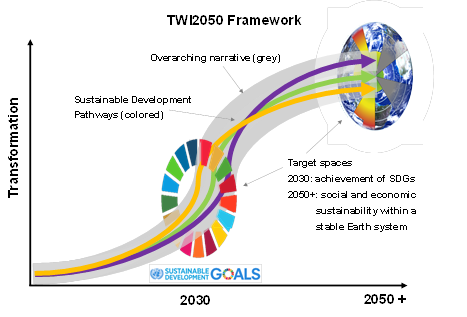 For “The World in 2050” (TWI2050), hundreds of experts and scientists around the world have gathered to map out the pathways in which the world reaches the UN Sustainable Development Goals (SDGs), which include the eradication of hunger and poverty by 2030 within the safe operating space of the planet – the planetary boundaries. Because many Earth system processes – such as the water cycle – are slow, the TWI2050 initiative has complemented the 2030 Agenda with a 2050 timeline. This request for a longer time horizon also aligns with the African Union’s time perspective outlined in the Agenda 2063 framework. There could be many ways to achieve the SDGs by 2030, to be mapped by The World in 2050 initiative. Courtesy of SwedBio and ICSU. What are the possible scenarios that could get us to those 17 goals, and to a sustainable global economy in subsequent decades? The TWI2050 initiative aims to find those scenarios. The initiative has, however, been missing key voices, in particular those from Africa. The complex-systems thinkers and computer-modelling experts involved have had difficulties incorporating the concerns of people on the ground and fully representing this diversity in perspectives. At the same time, African stakeholders are building capacity, showing eagerness to participate on the pan-African and world stages, while often lacking opportunities to do so – few African stakeholders have been invited to participate in global modelling efforts. The process leading up to the adoption of the SDGs has been called the largest global consultation that the UN has ever conducted. 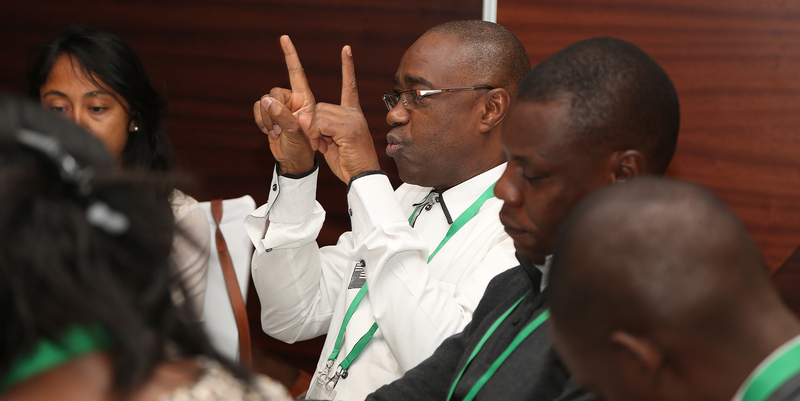 But it remains to be seen how African perspectives are to be included in mapping out the pathways to reach the goals. An initiative by the SDG Center for Africa, supported by SwedBio at the Stockholm Resilience Centre, provides a first step in including these perspectives. Grassroots organisations, government officials, business representatives, scientists, and activists from all regions of Africa are developing a collaborative partnership to ensure that local voices are heard in the global modelling effort, and to change the future discourse by providing new scenarios and alternative perspectives. A first African dialogue was held in August 2017 in Kigali, Rwanda, with a second following at the end of October 2018. The main focus of the dialogues is how agriculture can contribute to achieving the SDGs within the planetary boundaries. The first African Dialogue on The World in 2050 (TWI2050) took place in Kigali, Rwanda, in August 2017. Photo courtesy of SwedBio. Africa plays a key role in shaping the world’s sustainable development towards 2050 and beyond, to achieve the African Union’s vision of an “integrated, prosperous and peaceful Africa driven by its own citizens and representing a dynamic force in the global arena”. Global food demand is forecast to double by 2050.1 1. Valin, H., Sands, R. D., van der Mensbrugghe, D., Nelson, G. C., Ahammad, H., Blanc, E., Bodirsky, B., Fujimori, S., Hasegawa, T., Havlik, P., Heyhoe, E., Kyle, P., Mason‐D'Croz, D., Paltsev, S., Rolinski, S., Tabeau, A., van Meijl, H., von Lampe, M., Willenbockel, D., 2014. The future of food demand: understanding differences in global economic models. Agricultural Economics, 45: 51-67. https://doi.org/10.1111/agec.12089 See all references And according to UN projections, by 2100 more than 80% of the world’s people will be living in Africa or Asia, by which time Africa’s population may have grown from 1 billion to more than 4 billion. Per AGRA’s 2017 Africa Agriculture Status Report, the agriculture sector employs up to 65% of the African workforce, and the World Bank has projected that by 2030 Africa’s food and agriculture market could be valued at US$1 trillion. According to the UN Food and Agriculture Organization (FAO), 30 African countries endured 84 droughts between 2005 and 2016. The majority of Africans depend on rain-fed agriculture for their livelihoods, with low capacities to adapt to hazards, limiting efforts of sustainability. In African contexts, agriculture is typically seen not just as a trade or a source of livelihoods, but also as a practice that incorporates culture and traditions that are transferred from generation to generation. African knowledge systems that are inherently traditional or indigenous often share the view that our planet is imbued with life as much as humankind is, which impacts people’s environmental values and attitudes. Obayanju Babawale from Health of Mother Earth Foundation, a Nigerian environmental advocacy organisation, says that the agricultural lifestyle is profoundly intertwined in the Nigerian culture, and recalls a proverbial song he grew up with: “Ise agbe, nise ile wa … Eni ko si se ise ama ja ole … Iwe kiko lai si oko ati ada … Ko yi pe o …”, which translates from Yoruba to “Farming is the job in our land, whoever does not carry out this job will end up stealing. And any education that does not teach about farming is not complete”. Africa is diverse and extremely large; “one size fits all” policies and approaches are ill-suited to tackling the agricultural challenges of the continent. Instead, different perspectives related to ecosystems, social classes, gender, ethnicity, age, locality, and culture within the society need to be taken into account in agricultural planning. It is also essential that agriculture is seen as a respected source of livelihood – to increase investments and to attract skilled labour that meet the demands of the future. This can be done through the sustainable use of technology-supported farming that leverages local knowledge while inspiring the younger generation to carry the trade forward. Sustainably eradicating hunger in Africa requires a flourishing diversity of species in their natural environment. Flying insects, for example, are pollinators without which a vast tract of the plant kingdom, both wild and cultivated, cannot survive. A recent case in Rwanda underscored these pressures when a bee-keeping cooperative near Akagera National Park reported a significant threat to the bee colony due to a pesticide applied on a maize farm in a nearby district. Intensified farming methods can turn farmland into a wildlife desert, threatening not just bees but also soils and soil-dwelling creatures and other parts of the ecosystem, resulting in less productivity and fewer varieties of crops. Maintaining the variety of life and the quality of soils underpins the agricultural sector for the long term. According to a recent FAO report, “high-input, resource-intensive farming systems … have caused massive deforestation, water scarcities, soil depletion and high levels of greenhouse gas emissions”.2 2. FAO, 2017. The future of food and agriculture – Trends and challenges. Rome. ISBN 978-92-5-109551-5 PDF (ISSN 2522-722X online) See all references Depleted soils have severe long-term consequences including loss of livelihoods and migration. Data from Africa, on soils health and beyond, need to be included in global models and scenarios for the future, including in TWI2050. Any inclusive development agenda rests on successful agricultural development. Leaving no one behind entails sensitising everyone from policymakers to individual farmers, whether in remote areas or semi-urban settings. It also requires feeding voices, data, and other relevant information from Africa and beyond into international efforts like TWI2050 and the SDG Center for Africa. In the end, this pluralistic view will support the efficient implementation of the SDGs by 2030, and a better global outlook for all as the century progresses.